Happy Monday bloggies! Let me preface this review by saying, this is not my typical review. I actually found the Glukos brand on accident while on Facebook. After reading more about their products and searching through their website I really felt like it was a product I wanted to buy. To my disappointment when I tried to purchase it, I realized the product wasn’t for sale yet. This was a NEW BRAND (no wonder I had never heard of it). So, in my usual impatient fashion, I reached out the company on their website to ask for details on how and when I could get my hands on their goods. Surprisingly, they responded rather quickly and within a few weeks I had my hands on over half their product line. With all that being said, this may very well be my most thorough review. Being that I already liked this product on paper and it’s new, I really wanted to break down their claims and scrutinize their tastes, textures, and efficiency. One of the first things that caught my attention about Glukos was their emphasis of being “all natural”. Now, a lot of companies these days claim to be all natural, but more often than not, you find energy products loaded with chemicals, artificial sweeteners, and a very frightening slew of dangerous energy boosting compounds. As a nutritionist and an athlete I’m constantly looking for great natural products or at least as natural as I can get them. I have a very sensitive stomach you know, but I also care a lot about what I put in my body. Glukos contains no high fructose corn syrup, artificial preservatives, additives, colors or caffeine. It’s made of three simple ingredients: glucose, electrolytes and natural flavors; that’s it! Which also means this products is gluten free, dairy free, soy free and vegan. Glukos works by providing the body with, well, glucose! Glucose is a carbohydrate that your body needs to perform during athletic activity. It’s actually the bodies preferred source of energy. Have you ever heard of runners “Hitting a wall” or triathletes “Bonking” these phrases refer to the body depleting it’s stores of glycogen. When we eat carbohydrates the body breaks them down into glucose which is then broken down and stored (if not used) in the form glycogen. We normally have a very small store of glycogen in our bodies and when energy is needed (say for exercise) glycogen can be broken down and converted back to glucose. After prolonged physical activity (say more than 60 minutes) these stores can become depleted leaving us out of energy and feeling suddenly fatigued. This is known as “Hitting the wall” or “bonking”. I’m sure you yourself may have experienced this or know someone who has if they have participated an any endurance sport. So why does Glukos stand out from the rest? Let me take you back to my early days of nutrition and biology classes (those were the days!). In order for any food to become fuel it must first be digested. When food enters the mouth, enzymes in the saliva immediately begin to break down carbohydrates. Food then passes through your esophagus and down into the stomach where digestive enzymes work on further breakdown. Other endurance energy products are made with sucrose and fructose which are also forms of carbohydrates. Unfortunately, these carbs require a more extensive form of digestion because they do not fully breakdown until they are in the stomach and intestines. In order for your stomach and intestines to work efficiently they must have adequate blood flow, when your exercising blood flow is diverted to other areas of your body such as leg muscles for running. Products containing sucrose and fructose and other heavy ingredients require longer digestion times as well as more energy and blood flow in order to get them digested and converted into ready to use energy. Longer digestion times can lead to GI issues like cramping or even “bonking” if your loosing faster than you can replete. Glukos is plain and simple ready to go and it shows during performance. Taste: very fruitful but not overpowering or overly sweet. Very mild fruit flavor. No chemical or strange aftertaste like some other powered drinks. Performance: Love! I kept this chilled in the Glukos water bottle for my indoor triathlon a few weeks ago and it was perfect. Easy on the stomach and tasted great. No cramping or upset GI, one package (or bottle) lasted through the swim and the bike of the race. Come in 5 flavors: Apple cinnamon, cashew coconut, chocolate, lemon and peanut butter. Taste: Delicious! The lemon and apple cinnamon were good, not too sweet or tart. Tasted like lemon bars (the dessert)! I preferred the nuttier flavors however. I had the chocolate bar for breakfast before one of my 5am swim sessions. Oh Em Gee! So delicious! Performance: I tested these bars out as a pre-race meal. Typically on race day I will eat a carb loaded breakfast like oatmeal or peanut butter toast etc. then I will load up with a gel or other product just before the race begins. With Glukos testing, I didn’t want to confuse what I was feeling so I just ate the Glukos bar…alone…that’s it. 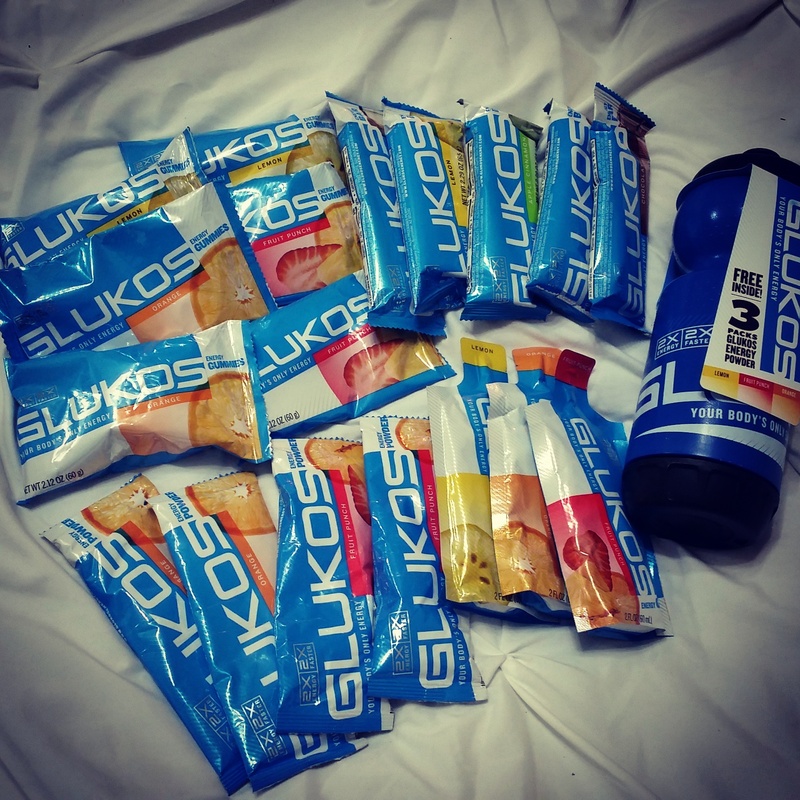 In fact on race day (sprint triathlon) I didn’t eat anything pre/mid-race except for Glukos products. I had a half of a bar for breakfast (less than an hour pre-race), then the other half of the bar exiting the swim. It was very light. Looking back I could have eaten the whole bar and been fine. No GI issues, nausea, and I felt energized and fueled. Come in 3 flavors: Orange, Lemon, Fruit Punch My Favs: ALL! Taste: I prefer the fruit punch if I had to pick one above the rest. The orange gummies reminded me of those orange slice gummy candies they sell at the gas station. They come in blocks and are just a little harder than most energy gummies I’ve tried. If you smooshed them between your fingers they wouldn’t smoosh down nearly as easily (very technical I know). They’re just a tad stiff. I still enjoyed them however. I found that the sweet taste and tougher texture made them pleasant and easier to eat while running. They also didn’t get stuck in my teeth after chewing which I appreciate considering those left over chucks can lead to a filmy mouth feel when heavily breathing. Performance: Home run! I had one full bag of these between T2 and the run. I just popped one in my mouth when I wanted one. Whether it was mid-run or lacing up my shoes, it didn’t matter because closing my mouth to chew them was easy and fast! If you have ever tried to eat a handful of gummies at mile 6 or 7 when your heart rate is up and your breathing pretty good, you know all-to-well the suffocating feeling I’m talking about. I have a legitimate fear of sucking back a gummy whole and suffocating myself during a run. Taste: Not bad, there was no distinct difference in the gummy and gel flavors. The gel consistency was unexpected but delightful. For those of you who have ever tried GU gel you know how thick and pasty they can be. Glukose gels are much thinner which I LOVE. I didn’t need to have it with a water chaser and I didn’t feel like I was suffocating trying to squeeze it out of the pack. It’s not a thick consistency at all, more like water. Only down side, you may need practice slurping it down mid run. It’s so thin its easily spillable. I’d really love to pour it into my handheld flask and store one in my hydration belt, that would be perfect. Performance: Top-notch! I have a fear of gels after my last half marathon. I ate two gels on the back half and by the time I got in my car post-race my GI tract was cramping so bad I couldn’t stand up straight. For the next 5 hours, any time I ate or drank anything, I felt shooting pains and cramping. We won’t even get in to what happened in the bathroom. I was so close to taking myself to the ER. Since then I’ve sworn off gels all together. If I have to use a gel I go with the PowerBar Performance Energy Blend. The only trouble here is that it’s very low in electrolytes with 0mg sodium but it does have 21g carbs . Glukos has 20mg sodium and 148mg potassium with 16g carbs so your getting a lot more energy and electrolytes from it. Overall, I’d give Glukos two thumbs way up. Throughout my testing I never found myself feeling fatigued or shaky when using the products during exercise which tells me, they kept me going. 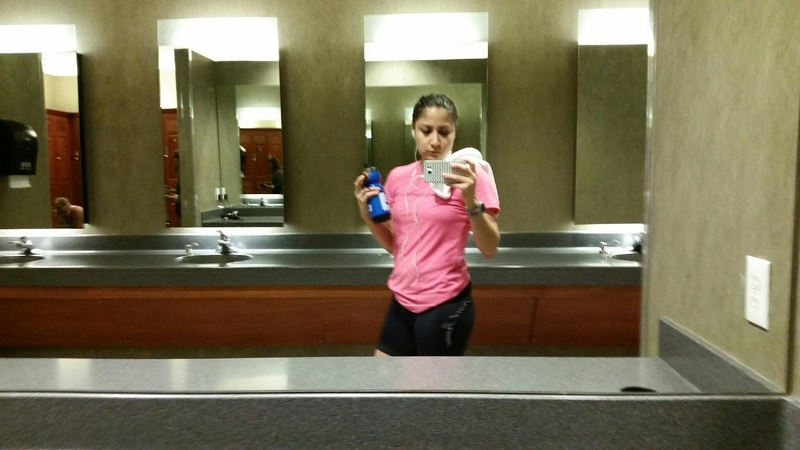 Even when doing my early morning workouts when I’m coming out of a fasting state, Glukos seemed to be able fuel me quickly. As for their claims of being all natural, well, just read the food label! It’s self explanatory. I would highly recommend any of the products I tried. For a full list of what they offer be sure to check out their website. Their full line is now up for sale and the prices couldn’t be better! I’ll be stocking up myself this week because I have another race this weekend for my 32nd birthday. We’ll call it 32, powered by Glukos! Maybe this race wont be cancelled?! We’ve had record breaking rain and flooding here in Texas so we’ll keep our fingers crossed! I have still continued to use Glukos products and purchase them as part of my regular training nutrition. I keep a regular supply in my cabinet as well. I recently raced Ironman Texas and used the Glukos bars throughout my 6 months of training as well as the Glukos gels during some of my rides. 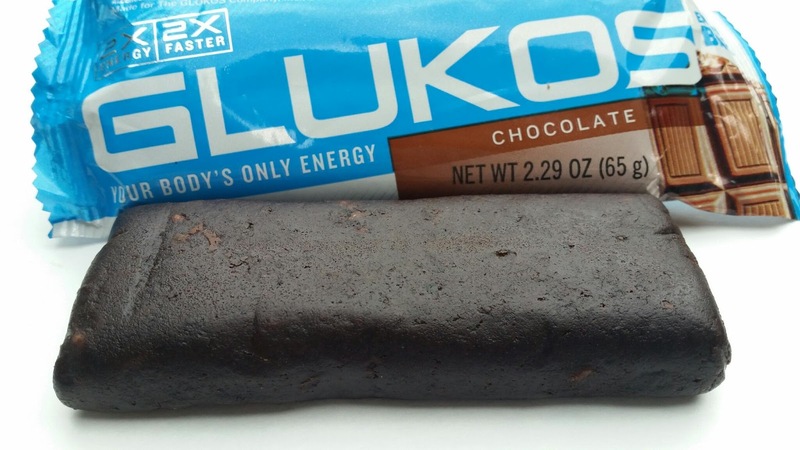 I LOVED the Glukos bar but unfortunately, it was discontinued. I don’t know why Glukos made this decision as the bar was one of the best products they offered. They now offer a line of protein bars however, these are not suited for mid-race nutrition. I literally ate one Glukos energy bar every morning before starting my training days. I could have turned into a Glukos bar! 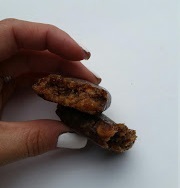 I will say that their protein bars are very delicious and are very light but they just dont replace the energy bar. Maybe I’ll do another review of their protein bars and powders in the near future? We’ll see. As for the gummies and gels: I have stopped purchasing the gummies for now. Not that I don’t like them, I have just found myself utilizing liquid nutrition more often these days. I would still purchase the gummies over another brand if I felt I wanted them for a race or training. They are, by far, the best tasting gummie I have had and they are easy to eat on the run. I also still use the gels every now and then, depending on my needs. During Ironman training, I noticed that the Glukos gels did not have enough sodium and electrolyte content to sustain my training needs in the warmer weather. I also found that the carbohydrate content was not broad enough to keep my energy levels up during long training rides. I still love the Glukos gels and will use them during my shorter rides (less than 2 hours) in cooler temps, but I don’t feel that they have enough energy or electrolyte content for longer rides. Overall, I would still highly recommend Glukos to anyone who is looking for a product for shorter training distances such as sprints or mid length course fuel. If you’re an ultra runner or Ironman athlete, I would recommend testing the product before making a final decision. Every athlete is different. Know your calorie, sodium, and hydration needs before you start testing products. Its important to have a base point and know what you should be consuming. So glad you're having success with Glukos! I'm pretty much addicted to the bars at this point. I like them for my early morning swim workouts and biking. Only bar I've ever tried that I can have mid workout. I expect to see a lot more of this product as time goes on. its been 2 years. can you comment on the product again? Great idea! in short, I still love Glukos. 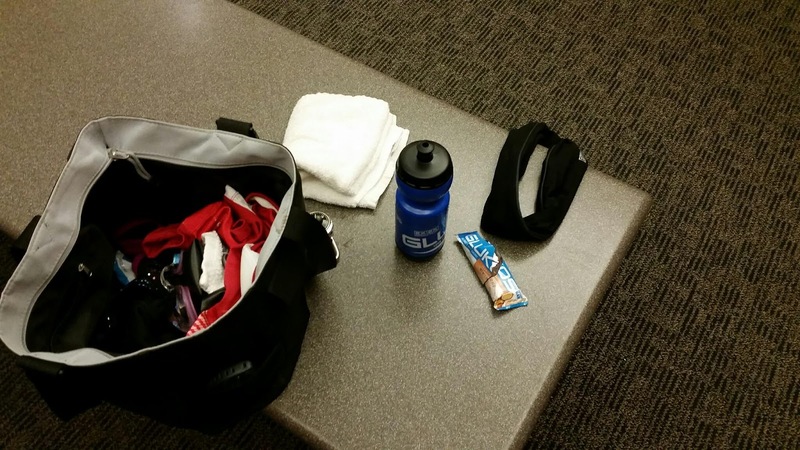 I used the Glukos bars throughout my recent training for Ironman. I ate one every morning before training swims and during my long bike rides in conjunction with Tailwind Liquid nutrition. Unfortunately they discontinued the Glukos bar.